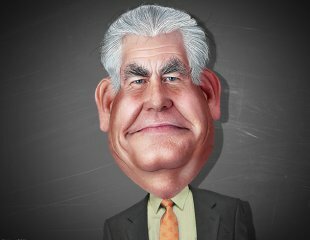 REX TILLERSON HAS BEEN MISLEADING THE PUBLIC ABOUT THE DANGERS OF FRACKING FOR YEARS (VIDEO) | "Global Possibilities"
Rex Wayne Tillerson, aka Rex Tillerson, is the chairman and chief executive officer (CEO) of ExxonMobil. Tillerson is President-elect Donald Trump’s nominee for United States Secretary of State. This caricature of Rex Tillerson was adapted from a photo in the public domain from Wikimedia. Louis Meeks’ well drew crystal clear water for thirty-five years. His water was so clean neighbors often came by to take a jug home. Then, in 2005, his water turned cloudy. Petroleum on the surface reflected rainbows and it smelled like a gas station. On New Year’s Day 2009, Norma Fiornento’s water well exploded, blowing a concrete slab off the top of the well. In the summer of 2010, Steve Lipsky found out by chance his water well was so polluted he could light the gas in his water on fire. When lit, the flame rose four feet above the well’s vent. When the shale gas boom hit, oil industry CEOs and their PR teams across the country had good reason to keep these cases quiet. New horizontal drilling technologies, combined with upgraded hydraulic fracturing technique, were about to unleash an American fossil fuel energy “renaissance.” Evidence that this new technology polluted drinking water would have enormously complicated their plans to sell “fracking” as a clean, climate-friendly answer to America’s energy needs. The oil industry quickly grasped that water pollution was a threat to the branding of their new technology. Industry lawyers and PR people developed a series of talking points and legal strategies to belittle or silence those who spoke out about the rapidly multiplying cases of water pollution associated with fracking. Some victims were simply bought off in exchange for silence agreements that prevented them from talking publicly about their cases. Even independent scientists trying to figure out how many wells were being polluted couldn’t get access the data from these sites. Other victims presented more of a problem. Industry scientists testified in court that there had always been gas in the water. People who pointed out that their water had been fine for decades and then turned bad after fracking started were portrayed as gold-diggers looking to fleece beleaguered oil companies struggling to supply the country’s energy needs. It worked. With help from sympathetic (and largely conservative) media outlets and a barrage of propaganda from industry front groups like “Energy in Depth,” the industry was able to brand the victims as liars and charlatans. “Their water was always like that” became a meme—a “sciencey” explanation that let the industry off the hook and blamed the victims. Each new case got the same treatment, and with oil industry PR money behind it, much of the nation believed it. Central to the oil industry’s branding of fracking as a clean source of energy is the claim that “there’s never been one case of water pollution from fracking.” Rex Tillerson, CEO of Exon (and now Secretary of State) looked straight into the camera and proclaimed in an interview with Charlie Rose in 2013 that after “a million data points,” there had “never been a verifiable case of fracking polluting drinking water.” The claim was patently false. At that point we knew aquifers had been polluted in Dimock Pa, Pavilion Wyoming and Parker Country Texas. Texas, Colorado, Wyoming resulting in dozens of water wells being polluted. Testing in all three cases pointed to gas extraction. In fact, there are documented cases of fracking contaminating drinking water as early as the 1980s. An EPA report from 1987 showed that “fracturing the Kaiser gas well on Mr. James Parson’s property, fractures were created allowing migration of fracture fluid from the gas well to Mr. Parson’s water well.” Industry itself admitted that fracking polluted the well. During the 1990s when modern fracking technologies were being pioneered in Texas, widespread instances of pollution were acknowledged by Texas regulators. But with enough people in positions of power and influence repeating it, the claim that there had never been a single case of fracking polluting drinking water became a “fact.” Media figures, oil industry officials, politicians, state regulators and gas and oil PR teams repeated the same story line: Fracking has been around for seventy years and there’s never been one documented case of pollution. There were numerous problems with this story. First, modern slick-water fracking combined with horizontal drilling is a relatively new technology. Comparing the “stimulation” of old vertical wells to modern fracks with pressures up to 15,000 PSI and hundreds of chemicals is like comparing a 1960s rotary phone to today’s iPhone. Also left out of the not-one-case story is a clever sleight of hand with the definition of fracking. The oil industry defines “fracking” as only what happens in the horizontal section of pipe thousands of feet underground. According to this reasoning, the only way fracking can pollute drinking water is by migrating through thousands of feet of solid rock. Pollution from the vertical part of the well—where most leaks occur—or surface activity is not in this technical definition pollution from fracking. Of course, most people understand fracking as the whole process of transporting equipment and chemicals to the site, drilling the well, extracting the gas and transporting it to market. Oil industry PR people are perfectly willing to use this confusion to their advantage. They can cite scientific papers claiming that “there has never been a case of fracking polluting drinking water,” and let the public believe they are referring to the common-sense definition of fracking as the entire industrial process. Industry leaders like Tillerson know all this, of course. But they just keep repeating the same misleading claim. If enough “experts,” authority figures and media personalities keep repeating it, the big lie becomes a fact in people’s minds. And once it’s embedded, these everyone-knows-it facts are very difficult to dislodge. An important part of the oil industry drive to control perceptions of fracking is demonizing its critics. Victims are portrayed as greedy fraudsters. Environmentalists are portrayed as hysterical, hypocritical busy bodies inventing scandals about a clean energy technology they should be celebrating. Filmmakers like Josh Fox, whose film “Gasland” shined a spotlight on cases of pollution associated with fracking, were subjected to withering character assassination campaigns. The IPAA, the oldest petroleum industry association in the nation, funded a film a film to discredit “Gasland” called “Truthland.” It was a shiny spin piece that painted any case of water contamination as naturally occurring. The best known of these fracking-denial films is “FrackNation” by Phelim McAleer. McAleer has made a career out of making films depicting environments as hypocritical elitists and pollution victims as frauds and liars. A darling of conservative news outlets, McAleer has been one of the most effective proponents of fracking-has-never-contaminated-drinking-water meme. Other media figures like Alex Epstein and Ezra Levant have cashed in by writing Ann Coulter-style books popularizing oil industry talking points. Levant is famous in Canada for his shouting-head attacks on oil industry critics. IPAA also fired up their own PR “news” outlet, Energy In Depth. In a memo announcing the new media group, IPAA stated the group’s goal; “EnergyInDepth.org: a state of the art online resource center to combat new environmental regulations,”. The venture was funded by major gas and oil interests including; BP, Anadarko, Marathon, EnCana, Chevron, Talisman, Shell, Halliburton and Schlumberger and Energy in Depth remains one of the main purveyors of the gas industry’s talking points regarding water, fracking and pollution. When a reporter or member of the public asks if fracking pollutes drinking water, they’re likely asking if any part of the entire process contaminates drinking water. That’s logical since the entire process will be used as the nation moves forward with the planned fracked gas revolution. When the question is answered with a resounding, seemingly convincing ‘NO’, the reporter or citizen thinks no water has ever been contaminated by any part of the fracking process. While industry has gotten away with this ruse for a decade, hundreds of cases of water contamination have become known. After a long fight, The Scranton Times got Pennsylvania’s Department of Environmental Protection to count the number of letters it sent to residents confirming incidence of water contamination during their fracked gas boom. That number was 243. The Associated Press found at least four states had recorded water contamination also. One troubling fact keeps us from knowing how many cases have actually occurred. When a homeowner settles their case with the operator, they are required to sign a silence agreement that disallows them from sharing any facts about their case. Not only do we know hundreds of cases of water contamination related to the fracking boom have occurred, as it is today, we can never know how many cases there really have been.